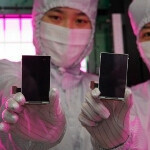 AMOLED panels for handsets to reach 363 million units shipped by 2015? A published research report forecasts that the number of AMOLED panels to be used for handsets will continue to move higher, reaching a total of 363 million units shipped by 2015. That would be a 332% increase from the number of panels shipped in 2011. By 2015, the report predicts, 88.7% of AMOLED shipments will be heading for handsets while 79.5% of the dollar amount of shipped AMOLED panels will find their way into smartphones. According to the same report, the surge in AMOLED use for handsets is led by Samsung. The Korean based manufacturer continues to build smartphones with larger screens and higher resolutions. Last year, LG Display and Samsung combined to make up 97.7% of AMOLED production capacity with that figure predicted to drop to 83.7% by 2015. Chinese based AMOLED producers are expected to hold a 7.4% share of production capacity in 2015 with manufacturers in Taiwan and Japan also forecast to pick up production of the panels over the next two years. Why are IPS screens more prone to dead pixels while AMOLEDS aren't? Any scientific explanation behind this? It might be because of the differences in manufacturing and different components they use, as dark/stuck pixels occurs mostly due to to the transistor getting stuck on or off.